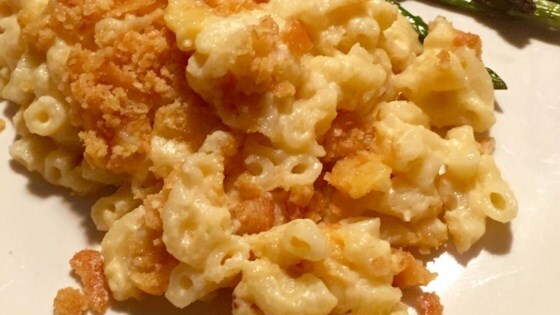 "This recipe was given to me by my friend Katie. It's a longtime favorite in her family." Turn off heat and stir in Cheddar cheese until the cheese is melted. Add the macaroni and stir to coat. Pour the mixture into a 9x13-inch baking dish. Mix the 1/4 remaining cup melted butter and crushed crackers together in a bowl; scatter the cracker mixture evenly over the macaroni mixture. Bake in preheated oven until golden brown on top, about 45 minutes. A buttery cracker topping and rich cheese sauce make it a family favorite. This was really good! I added about a half teaspoon each of paprika and dry mustard, and mixed more grated cheese into the ritz crumbles. Yum! This was quite good, I did use 3 differnt types of cheese, cheddar, extra sharp and mozzerella, I also used pepper and did not do the cracker topping.